We have two indoor jumping shows in May on the 5th and 19th......... In June we have two shows with indoor and outdoor jumping rings and mini Cross Country June 9th and 23rd...... More details and full schedule on the Show Page. Any rosettes that you require that are not in our brochure we will willingly try to supply. We can obtain Christmas, valentine, Wedding and various other ribbons if you require a rosette for a special occasion just phone and we will do our best to help .Single rosettes can be boxed in presentation boxes. We look forward to supplying your horse show, dog show or any other occasion. with (1st 2nd 3rd etc)and are the same colour as the ribbon. 1st BLUE, 2nd RED , 3rd YELLOW, 4th GREEN, 5th LILAC, 6th BURGUNDY, CLEAR ROUND,SPECIALS, HIGHLY COMMENDED, VET , JUDGE ETC IN ASSORTED COLOURS. This knife pleated rosette comes in a multitude of colours and the choice of combination is yours.The centres are with gold foil with the show or club title and the award and or logo in the centre. As above but much tighter pleat. 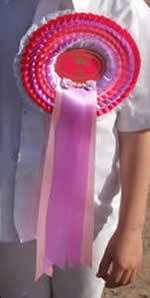 These rosettes are made from woven edge satin ribbon. They are produced in a box pleat to give it that extra special effect. 68mm centres are printed with gold foil depicting the show or club title and the award or logo in the centre. Wide tails are 10p extra. Please note a minimum of four weeks notice needs to be given as this ribbon is purchased specially. 68MM DIAMETER ROUND BADGES WITH BROOCH PIN IN A CHOICE OF COLOURS WITH THE FOLLOWING TITLES. JUDGE. STEWARD,VET,COMMITTEE. PRESIDENT. TREASURER. SECRETARY. - 50p Each. WITH TITLE AND SHOW,CLUB NAME OR EVENT - 60p Each. *Gold , Silver and Bronze metallic are 5p extra.